WARNING: This video is graphic and disturbing. It is placed here as evidence to call for an independent UN investigation and to call on Western countries to respect the Arms Treaty and stop the transfer of arms to Saudi Arabia. 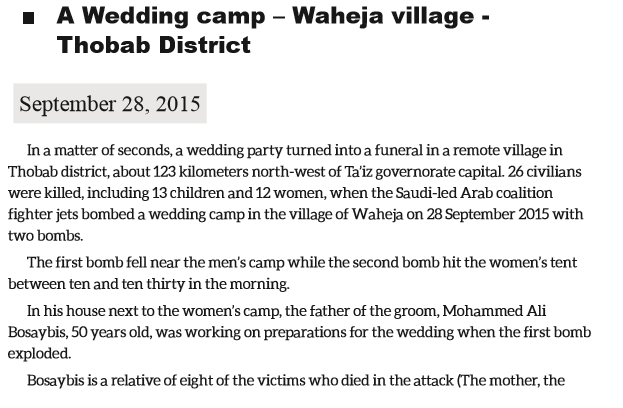 On Monday 28th September 2015, the Saudi led coalition air strikes hit a wedding party. The strikes were on two tents in the Red Sea village of Waheja, near the port of Al-Mokha, Thobab district. At least 26 civilians were killed, including 13 children and 12 women. The death toll would have been higher had it not been for the first bomb landing near to the men's tent, and as a result many people fled. 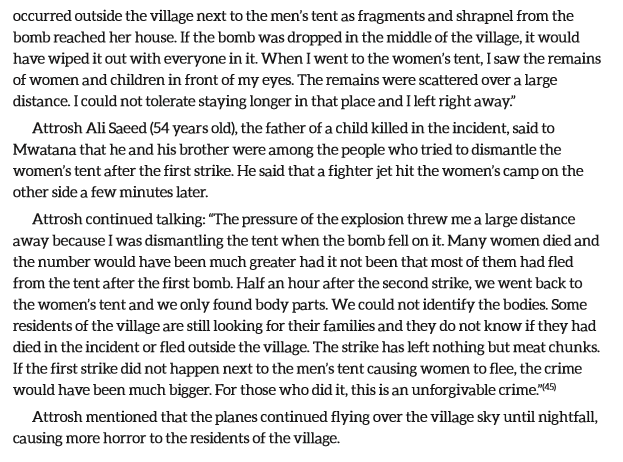 The second bomb however fell directly on the women and children's tent destroying all of those inside. Jets continued to fly over the village the rest of the day terrifying all of the residents.